Clothing/Jewelry Description A summer print housedress, brown and white shoes, a green turban, possibly a sweater, and no stockings or jewelry. Distinguishing Characteristics Caucasian female. Black hair, gray eyes. Some accounts spell Lelia's name "Lela." 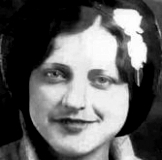 Lelia and her only child, Mary Rachel, were last seen in their hometown of Carolina Beach, Carolina on May 10, 1941. Lelia took Mary Rachel and left home at 9:00 p.m.
Lelia and Mary Rachel have never been heard from again. Their vehicle was apparently never recovered. Authorities investigated the theory that Lelia murdered her daughter and took her own life, but there was no evidence to support this. Lelia and Mary Rachel were declared legally dead in 1948. Updated 4 times since October 12, 2004. Last updated December 21, 2013; date of birth added.